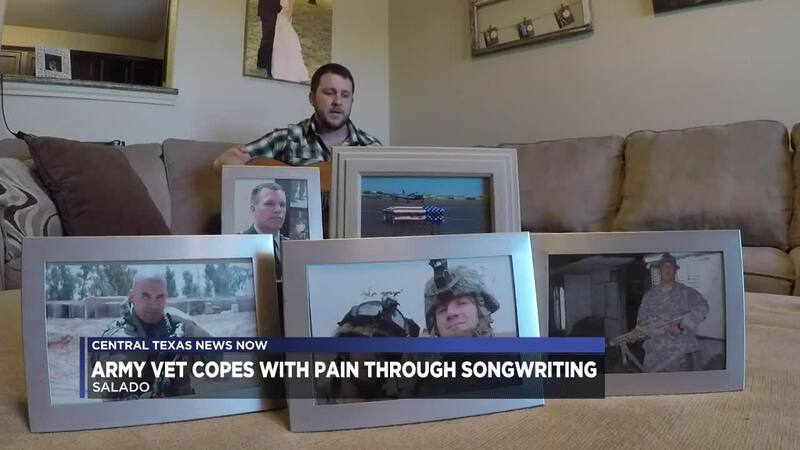 SALADO, TX — Army veteran Nick Sterling pours his pain into songwriting. One of the first songs he wrote is about ramp ceremonies, a memorial service for a fallen soldier that's held at the airport before their body is carried home. He said there was never time to mourn after saying goodbye to a friend. He usually returned right back to war. "Being 18, 19, 20 years old and losing a lot, I didn't know how to deal with it," Sterling said. "That was normal. That's what my life became." Sterling served from 2005 to 2008. Sterling's battalion lost more than 20 men. His platoon lost three. "IEDs and a helicopter crash took out quite a few," Sterling said. "I hit a few IEDs myself and one that took out my truck at the very end with two weeks left of my deployment." Even after returning home, he's still losing friends. Five of them have died by suicide. "The guys that we lost to suicide, I couldn't say if it was PTSD or the transition or what because they were the ones we never thought we'd lose that way," Sterling said. On April 9, a Veterans Affairs clinic in Texas shut down after a man killed himself in its waiting room. Witnesses said hundreds of people saw the man shoot himself. Sterling said this tragedy shows how many people are still in need of help. "It's been commonly lately," Sterling said. "I think if a veteran feels the need, that if they're going to kill themselves they're going to do it in a VA, I'd say that's more about sending a message than anything." Sterling said many veterans think the VA is their only option, but that's not the case. "The VA in general, there are good people there that do their best but they're highly understaffed and underfunded," Sterling said. "I had a weird relationship with the VA to start because I said, 'oh I don't need them' and I think that's what a lot of guys go through, so I just went and found my own way," Sterling said. Sterling found support through music, equine therapy and the Lone Survivor Foundation. He said veterans should look for organizations that donate their time to veterans so they don't have to worry about getting insurance or the VA involved. "I think everyone deals with it in their own way," Sterling said. "Music doesn't work for every veteran. Go out there and find what works for you and then stick to that and get it done." Sterling is now a full-time musician with a wife and child. He also has a baby on the way. The Lone Survivor Foundation provides therapeutic retreats for service members and their families affected by Post-Traumatic Stress, mild Traumatic Brain Injury, chronic pain and military sexual trauma. For more information on the organization, click here . Any veteran, family member or friend concerned about a veteran’s mental health may contact the Veterans Crisis Line at 1-800-273-8255 and press 1 or text 838255. Trained professionals are also available to chat online . The lines are available 24 hours a day, 7 days a week. The Veteans One Stop in Waco also offers counseling and other services to veterans.